So many times I am asked questions about why many students seem so disengaged in math. I ask these teachers to flip through their resources and see how many of them truly help students see the real life application of math–and solve rigorous, engaging problems that students can relate to. 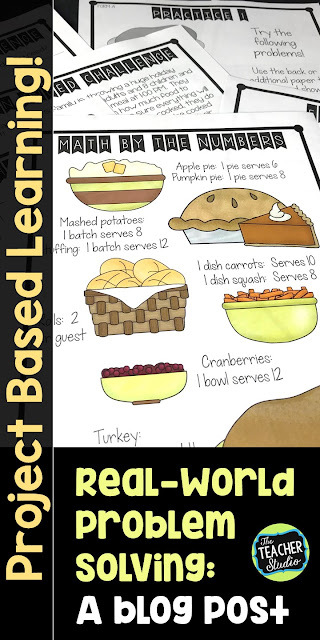 PBL (project based learning) can help make the connections between the math skills and the real world, and my students are always BEGGING for more! It’s always fun to tie this work to the seasons, so I have tried to make a number of these projects that are the perfect break from routine to do at those special times of the year. This one? A “feast” project that is perfect for Thanksgiving! It would be hard to list all the benefits of having students dig into real-world math challenges and other project-based learning opportunities. Let me just leave you with a few. They nurture collaboration and math communication. There are often many solutions. These experiences provide students with a chance to struggle (and this is so valuable!). Connections to the real world help students realize WHY we do math! Students who learn in different ways can shine. They allow time for teachers to coach. They are perfect for differentiating! It may seem contrary to what one might thing–how can a challenging, rigorous task be easy to differentiate? Aren’t they best for our top students or fast finishers? Not at all. I love using these tasks in a number of ways–and I DEFINITELY want ALL my students to have exposure to and experience with quality, real world tasks. How can we help them succeed? Strategically partner/group them with a supportive team. Spend more time scaffolding directions or simplifying directions if needed. Reduce the amount of writing or allow them to use technology. Use the tiered problems included so they can do the same work at a slightly more simplified level. Provide more frequent coaching opportunities. Provide the emotional encouragement and support to keep them hungry to solve the task. And don’t forget our super capable students! A list of additional challenges and extensions are included as well so they can take this project as far as they want! Remember, self-esteem and mathematical mindsets are elevated by tackling challenging work–not by be given simple tasks! How Can I work These Tasks Into My Math Schedule? I just wanted to share a few ideas on how to work this type of problem solving into your schedule–which I’m sure is already packed! 1. Consider introducing this as a whole-class activity where you give students/groups some time to get started and get clarity on the project. After that, it becomes something they work on when they have extra time. 2. Dedicate a few days to the task and let students get as far as they can. There are logical stopping points in each task–so some students might only solve the main challenge, others may tackle some of the computation work, and still others may try some of the extensions. You can let students choose their path or you can steer them the way you wish! 3. Use this as an enrichment activity for students who are “fast finishers” or who may need compacting out of their current unit. This is a perfect, meaningful independent math task for students to do if they already have mastery of the current math topic. 4..Give students a small chunk of time each day to work on this–either in a center, as a warm up, or at the end of class. Over time, students can get as far as their initiative and math will take them! I hope these ideas get you intrigued enough to dabble in some high level math–for ALL your students! This task focuses on a feast…but there are SO many other options out there! Want to pin this for later? 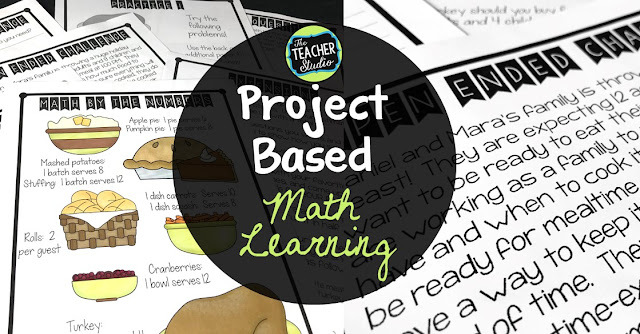 Want to check out other Project Based Learning Tasks?